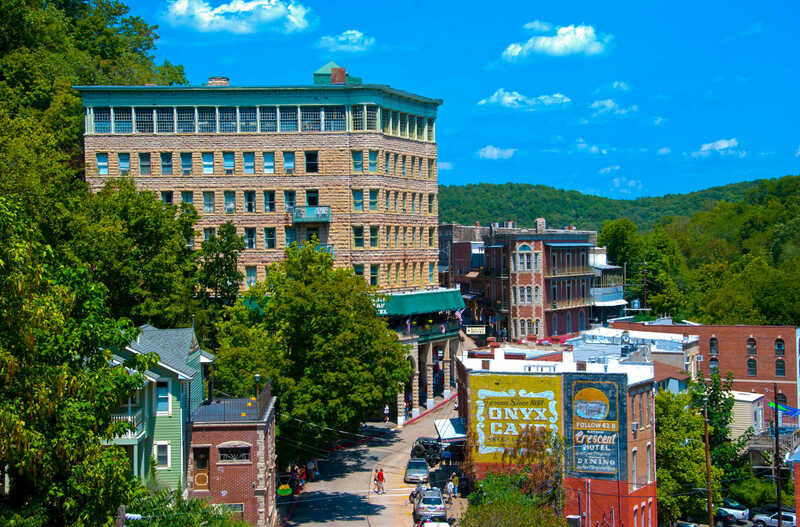 What words best describe Eureka Springs, Arkansas? Quirky, a festival venue, a place of pilgrimage for nostalgia-buffs in the Ozark Mountains? All would apply to this town of 2,073 people, located southwest of Branson, Missouri across the state line. It attracts a remarkable number of tourists, which range from 700,000 to 750,000 a year. 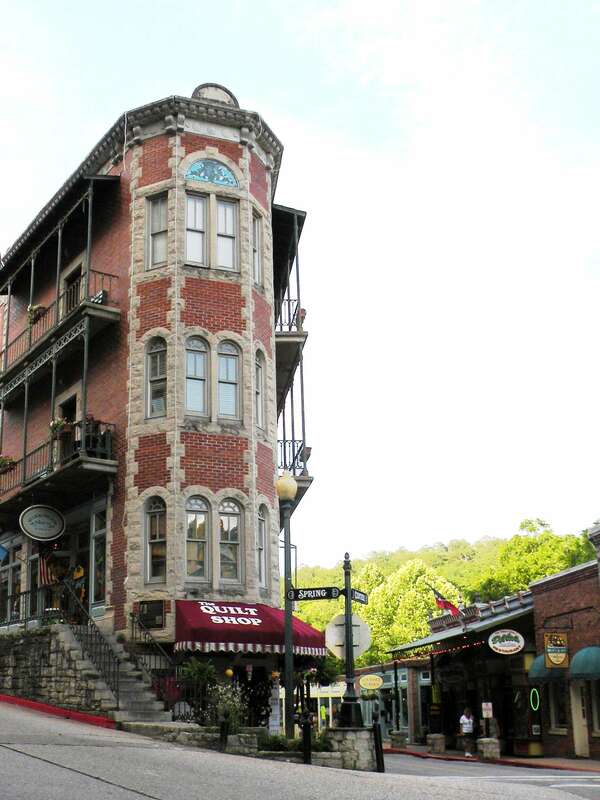 More than one visitor has remarked on Eureka Springs’ similarity to a European mountain village with its hilly, winding streets and U-shaped intersections in the central historic district. Indeed, the two square-mile area is often called Little Switzerland, says a spokeswoman for the City Advertising and Promotion Commission. As if to emphasize the town’s mountain origins, there is Little Switzerland Realty, the Alpen-Dorf Motel, now closed, Swiss Village Inn, and Edelweiss Inn. The comparison can get a little murky since almost every business in the historic district is tourism-oriented except for the city hall and county courthouse. According to official data, there are 25 food-related businesses and 57 shops and galleries. Visitors will see T-shirt shops, souvenir outlets, restaurants and bars, gourmet food stores and clothing shops. “We’re 100% for that,” the spokeswoman says unabashedly about the focus on tourism. Even the district’s bank invites visitors to see its early 1900s decor, furniture and art work but the money and tellers are real. And talk about tradition! The same family has owned The Cornerstone Bank for more than a 100 years. But find an aspirin for a headache or a toothbrush or fill a prescription? Better go to the suburbs. There are only a few fast-food restaurants and none in the historic district, city promoters are proud to say; McDonald’s, Subway and Pizza Hut are located outside of the district. But I’m not sure that this exclusion is a good thing. In the city of Rothenburg, Germany, a small McDonald’s blended in perfectly with the ancient architecture. 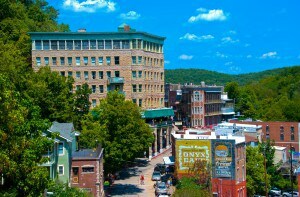 But what is Eureka Springs doing in Arkansas anyway, a state famous for its Wal-Mart Stores, Inc. headquarters, chicken processing, rice growing and Bill Clinton? So a little history is in order. The town was founded in 1879 when settlers discovered medicinal springs in the area. It was, as is said, a “eureka” moment, which is how the town gained its name. 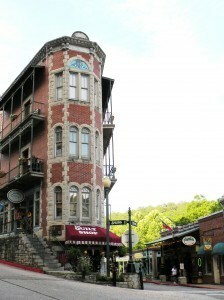 Once the town began to grow as a result of its healing waters, a railroad arrived and sealed Eureka Springs’ reputation as a resort. Businesses continued to spring up and new residents built homes. Today 60 springs are scattered around the town in landscaped settings, the promotion office spokeswoman explains, but the water isn’t drinkable due to pollution and other causes. 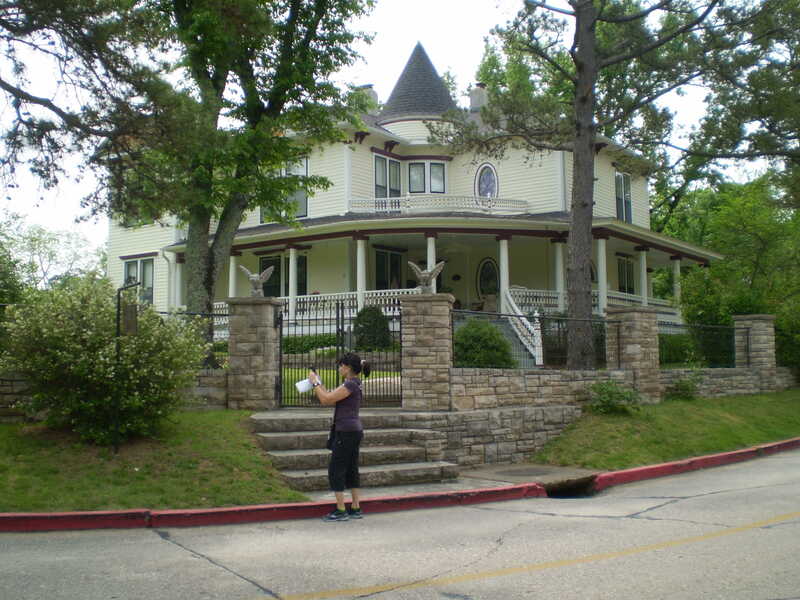 The Eureka Springs Preservation Society’s guidebook lists six walking tours that make it easy to explore this unique place. But some sections in the two-square historical district do have steep slopes and no sidewalk. 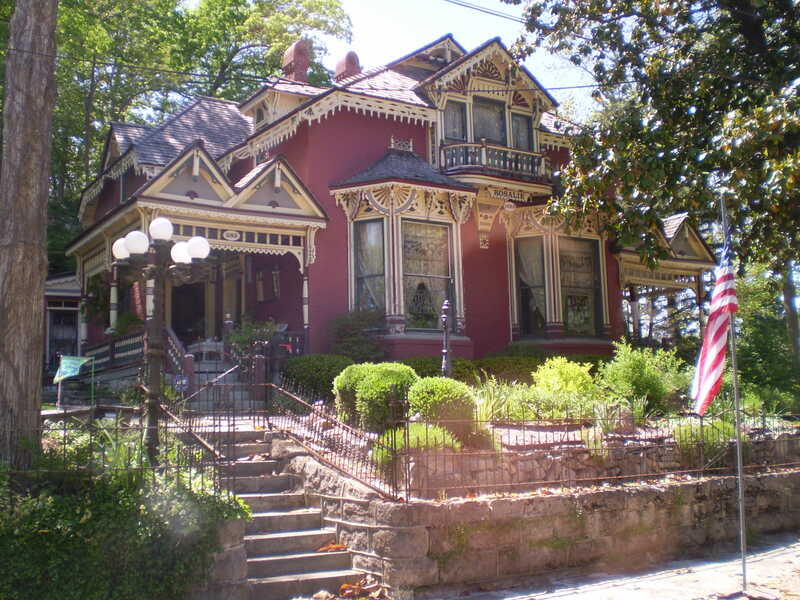 On foot, the advantage is that visitors will get a close-up look at elegant Victorian homes. Allow 45 minutes to an hour for each tour. To see the town from a bus, contact Eureka Van Tours whose owner and driver Michelle McDonald dresses in period costumes. A public transit system covers three color-coded routes with a fare of $5 for a daily pass or $3 for one ride. If the bus isn’t running, taxi service is available. The system offers rides to five of the area’s key attractions: a dramatically-designed church in the woods, known as Thorncrown Chapel, the Christ of the Ozarks statue, the Village at Pine Mountain, Eureka Springs North Arkansas Railway and the residential historic district. The popular ghost tours purport to reveal apparitions of guests “who check out but never leave,” and are conducted by a guide in period costume. In addition to the Crescent Hotel, other historic lodgings include the Palace Hotel and Bathhouse, the New Orleans Hotel & Spa, the Grand Central Hotel, and the Basin Park. Another unusual structure is the district’s Flat Iron Building, which includes two floors of lodging named the Flat Iron Flats plus two floors of shops. It brings to mind New York’s Flat Iron skyscraper that was completed in 1902. 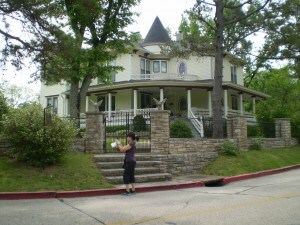 Eureka Springs’ original structure dated from 1880 but it twice burned down and was only rebuilt in 1987, says the promotion office. 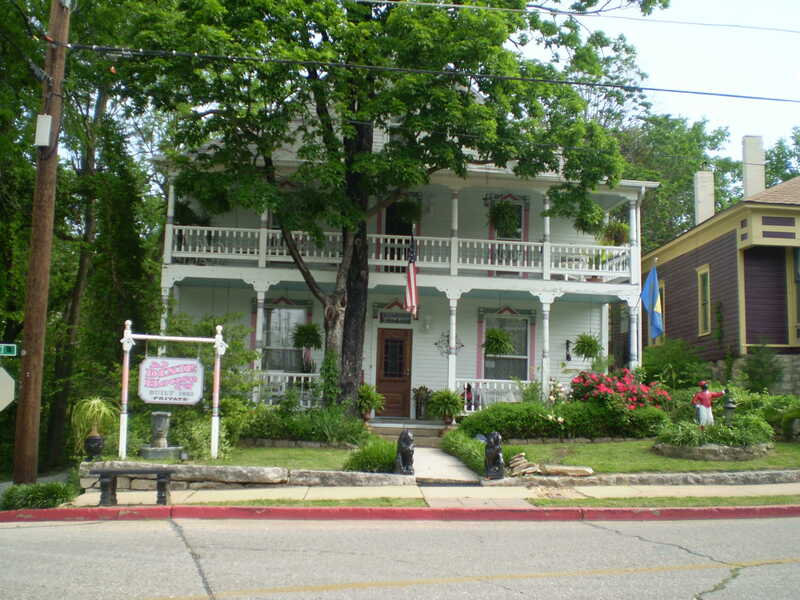 Eureka Springs is also noted for the number of bed & breakfast lodgings. Our group hunkered down at the All Seasons Inn, one of the town’s 39 B&Bs. In addition, there are a total of 35 hotels. For night life, visit the Pine Mountain Jamboree for country music complete with religious symbols and salute to military at the end of the Branson-type show. Performances are scheduled on selected days from March through December. Our van driver and guide Michelle took us to one of the town’s funkiest bars, the Chelsea’s Corner Cafe, which features live music each night and craft beers and wouldn’t be out of place in Greenwich Village. 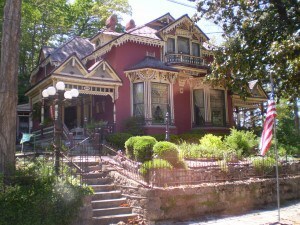 McDonald, who knows the town, has praised Eureka Springs’ live-and-let-live attitude. We briefly visited The Village at Pine Mountain, a mini-shopping center with a large parking lot used for farmers’ market, arts and crafts shows and car shows. At the Eureka Springs North Arkansas Railway, visitors can ride in a 1920s vintage train two and a half miles back and forth in restored vintage cars, which also offer lunch and dinner rides. Across from our B&B is the Adventure Mountain Outfitters that rents bikes and organizes float trips on the White River for visitors seeking outdoor recreation. This is primarily a drive market, but flights are available into the Branson airport or the Northwest Arkansas Regional Airport in Bentonville (Wal-Mart’s headquarters) where visitors can rent cars. 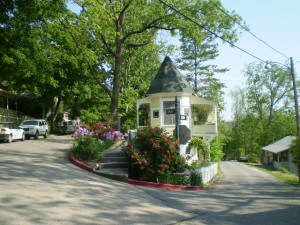 Each airport is about 52 miles from Eureka Springs.